This document was published by the Web Payments Working Group as a Working Draft. This document is intended to become a W3C Recommendation. The terms payment method, PaymentRequest, PaymentResponse, supportedMethods, paymentDetailsModifier, paymentDetailsInit, PaymentMethodData, PaymentItem, ID, show(), and user accepts the payment request algorithm are defined by the Payment Request API specification [ payment-request ]. Figure 1 A Web payment app is associated with an origin. Payment handlers respond to PaymentRequestEvents. PaymentManagers manage the definition, display, and user selection of PaymentInstruments. A PaymentInstrument supports one or more payment methods. A PaymentWallet contains one or more PaymentInstruments and may be used to enhance the user experience (e.g., business wallet and personal wallet). 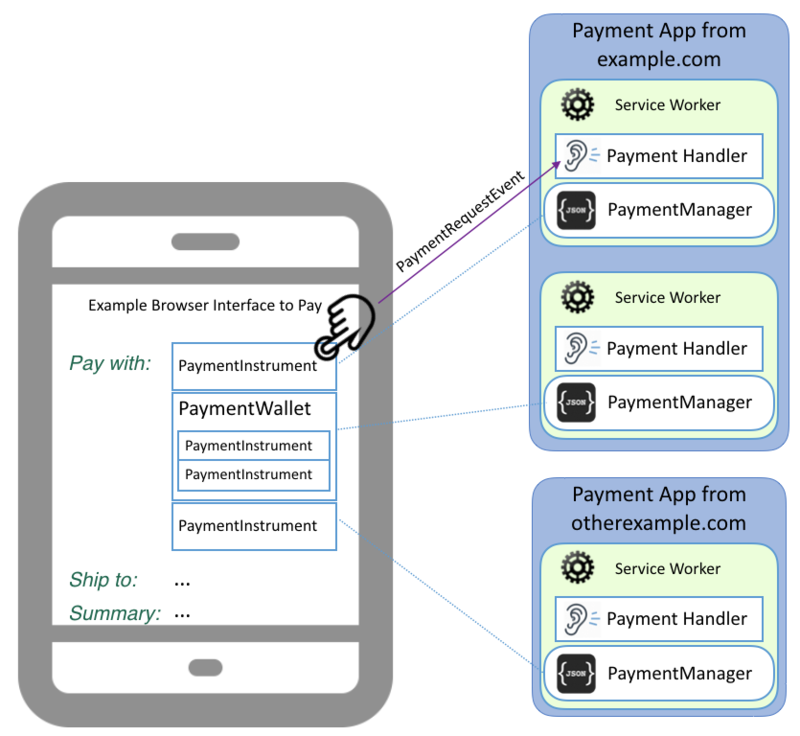 Figure 2 Payment Handler API enables Web apps to handle payments. Other types of payment apps may use other (proprietary) mechanisms. Let permission be the result of running retrieve the permission state algorithm of the permission associated with payment handler's origin. If permission is "prompt", ask the user whether allowing adding new payment instruments for the current settings object's origin is acceptable. If it is, set permission to "granted", and "denied" otherwise. Let permission be the result of running retrieving the permission state of the permission associated with payment handler's origin. If permission is not "granted", then return a Promise rejected with a NotAllowedError. Let convertedIcons be the result of running the convert image objects algorithm passing details.icons as the argument. If the convertedIcons is an empty Sequence, then return a Promise rejected with a TypeError. Let fetchedImage be the result of running the fetching image object passing icon as the argument. The src member is used to specify the ImageObject's source. It is a URL from which the user agent can fetch the image’s data. The sizes member is used to specify the ImageObject's sizes. It follows the spec of sizes member in HTML link element, which is a string consisting of an unordered set of unique space-separated tokens which are ASCII case-insensitive that represents the dimensions of an image. Each keyword is either an ASCII case-insensitive match for the string "any", or a value that consists of two valid non-negative integers that do not have a leading U+0030 DIGIT ZERO (0) character and that are separated by a single U+0078 LATIN SMALL LETTER X or U+0058 LATIN CAPITAL LETTER X character. The keywords represent icon sizes in raw pixels (as opposed to CSS pixels). When multiple image objects are available, a user agent MAY use the value to decide which icon is most suitable for a display context (and ignore any that are inappropriate). The parsing steps for the sizes member MUST follow the parsing steps for HTML link element sizes attribute. The type member is used to specify the ImageObject's MIME type. It is a hint as to the media type of the image. The purpose of this member is to allow a user agent to ignore images of media types it does not support. Let outputImages be an empty Sequence of ImageObject. If image.type is not a valid MIME type or the value of type is not a supported media format, then return an empty Sequence of ImageObject. If image.sizes is not a valid value, then return an empty Sequence of ImageObject. Let url be the result of parsing image.src with the context object's relevant settings object's API base URL. If url is failure, then return an empty Sequence of ImageObject. If url's scheme is not "https", then return an empty Sequence of ImageObject. According to the step 2.3, it is also possible to use the relative url for image.src. The following examples illustrate how relative URL resolution works in different execution contexts. Example 1: Resolving the relative URL of image.src in window context. Example 2: Resolving the relative URL of image.src in service worker context. Once the user has selected an Instrument, the user agent fires a PaymentRequestEvent and uses the subsequent PaymentHandlerResponse to create a PaymentReponse for [ payment-request ]. This attribute indicates the total amount being requested for payment. It is of type PaymentItem dictionary as defined in [ payment-request ], and initialized with a structured clone of the total field of the PaymentDetailsInit provided when the corresponding PaymentRequest object was instantiated. This method is used by the payment handler to provide a PaymentHandlerResponse when the payment successfully completes. [[fetchedImage]] undefined This value is a result of fetching image object or a fallback image provided by the user agent. If the payment handler has not provided a PaymentHandlerResponse, reject the Promise that was created by PaymentRequest.show() with a DOMException whose value "OperationError". If url's origin is not the same as the service worker's origin associated with the payment handler, return a Promise rejected with a SecurityError. If this algorithm is not triggered by user activation, return a Promise rejected with a InvalidAccessError. The user agent receives a successful response from the payment handler through resolution of the Promise provided to the respondWith() function of the corresponding PaymentRequestEvent dictionary. The application is expected to resolve the Promise with a PaymentHandlerResponse instance containing the payment response. In case of user cancellation or error, the application may signal failure by rejecting the Promise. Set handlerResponse to the PaymentHandlerResponse instance used to resolve the PaymentRequestEvent.respondWith() Promise. If handlerResponse.methodName is not present or not set to one of the values from PaymentRequestEvent.methodData, run the payment app failure algorithm and terminate these steps. Create a structured clone of handlerResponse.methodName and assign it to response.methodName. If handlerResponse.details is not present, run the payment app failure algorithm and terminate these steps. Create a structured clone of handlerResponse.details and assign it to response.details.